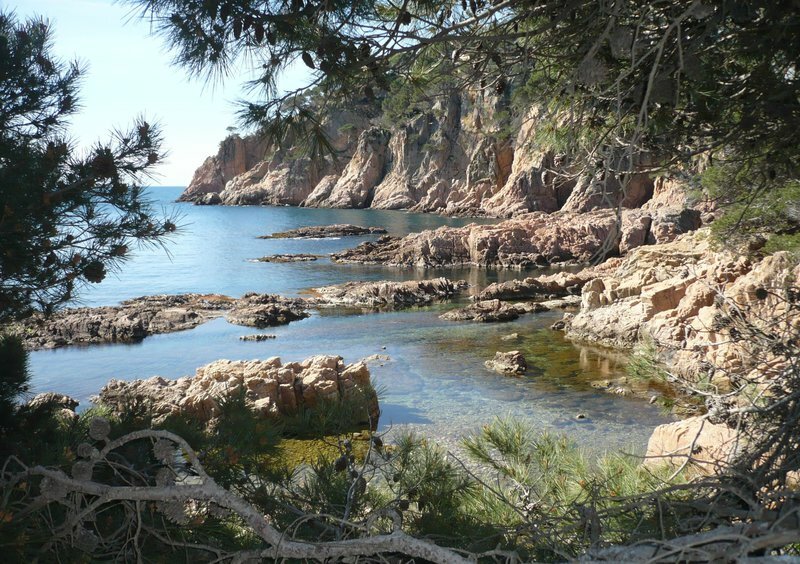 Aigua Xelida cove in Palafrugell. A. VILAR. Makes our feet and fingers glow’. Well, I’ve just been out but there was no snow, although threatened, and since I forgot my gloves, my fingers are certainly not glowing, they’re freezing! But this is not what I intend to write about. Dear reader, what does the word ’postcards’ bring up in your mind? Perhaps sun, sand and seaside holidays or pictures of Big Ben or the Eiffel Tower. For me, it’s different. Postcards are moments of stilled heightened awareness. Like yesterday, I went out as usual, for a walk and had to stop entranced, when I saw all the fences on each side of my road festooned with tiny frozen drops. Snow-drops. Whether by surprise or transferred consciousness, my dog, Toffee, stopped too. Postcards are also those strong remembered moments such as a place I go to, Trigonos, a guest house in Nantlee, Wales. At moments during the meditation we do there, I stop and look out of the window – it appears as a painting – the view of the lake and the tremendous Snowdon mountain in the background with its purple heather and patches of black slate. Transfixing. Today I had a postcard-moment. They often seem to happen while I’m walking outside. This time, I glanced down and saw, nestled in among the moss, a tiny violet flower peeping out of the grey rocks beside the path.